Every manufacturing facility wants production equipment to operate reliably. When the equipment does what it needs to do when it needs to do it, plant output and profitability is maximized. No organization wants assets to break down, to produce poor quality products, or to operate inefficiently. We want them to operate perfectly. Unfortunately, we don’t live in an ideal world; no physical asset operates flawlessly forever. In most organizations, breakdowns are the norm. Quality and productivity losses are high. Scheduled shipments are missed. Corporate leaders demand that the plant cut costs. The only time anyone pays attention to maintenance is when production demands that they “get it running again, and quickly!” The majority of work is done on a reactive basis. Run to failure maintenance is a reactive management technique that waits for machine or equipment failure before any maintenance action is taken. It is in reality a no maintenance approach. It is also the most expensive way to manage maintenance. Reactive maintenance centers on the craftsperson. When a problem develops, a craftsperson is dispatched to identify and correct the failure or deficiency. Usually, he must make multiple trips to the tool room for additional tools, multiple trips to the shop for additional technical information, and multiple trips to the spare parts storeroom to get spare parts to repair the problem (and any secondary damage that occurred because the equipment was allowed to run to failure). Productivity is low and costs are high. In most cases, this approach results in excessive downtime, cost and both production and maintenance effort-hours. This reactive management method forces the maintenance department to maintain extensive spare parts inventories that include spare machines or at least all major components for all critical equipment in the plant. The alternative is to rely on equipment vendors that can provide immediate delivery of all required spare parts. Even if the latter is possible, premiums for expedited delivery substantially increase the costs of repair parts and downtime required to correct machine failures. To minimize the impact on production created by unexpected machine failures, maintenance personnel must also be able to react immediately to all machine failures. The net result of this reactive type of maintenance management is higher maintenance cost and lower availability of process machinery. Analysis of maintenance costs indicate that a repair performed in the reactive or run to failure mode will average about three times higher than the same repair made within a scheduled or preventive mode. There is a better way. If the right systems, structure, processes and procedures are in place and executed well, losses are minimized, the operation is stable, production output is maximized and quality is high. We call this a state of Reliability Excellence (Rx). Most reactive organizations assume that the maintenance function is responsible for physical asset reliability. After all, when a reliability problem occurs, who is on the hot seat to get it corrected? Unfortunately, when an analysis of the true root cause of failure is done, the source of the defects that created the failure typically has nothing to do with the maintenance of the equipment. This model illustrates that defects can be produced at any point in the life cycle of a physical asset. If the engineer designing the system selects equipment that is minimally adequate, a potential defect is produced. If the purchasing agent selects a poor quality component because it’s cheaper, a potential defect is produced. If the storeroom attendant does not store the component in a way that protects its physical integrity, a potential defect is produced. If the person installing the asset does not use precision methods for alignment or balancing, a potential defect is produced. If the operator starting up and running the equipment does not use the proper procedures, a potential defect is produced. If the craftsman performing routine maintenance does not do so with the appropriate degree of precision and care, a potential defect is produced. All of these defects have the opportunity to result in throughput losses, quality losses or downtime. The end result is that we pay a penalty in manufacturing performance and spend labor and material resources unnecessarily. 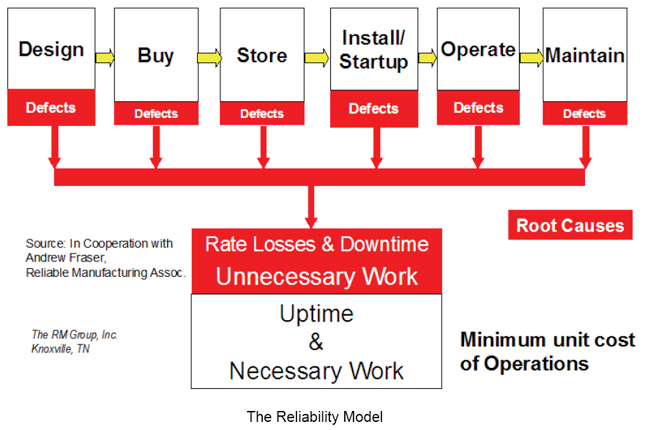 Achieving high reliability in manufacturing operations minimizes waste, maximizes output and minimizes cost. It allows us to get the most out of our physical assets. Reactive organizations experience significant production losses in each category. Planned shutdown losses – breaks, shift changes, no market demand and downtime due to planned maintenance. Unplanned shutdown losses – equipment breakdowns, setups and changeovers, tooling and parts changes and startups/adjustments. Improved reliability results in lower maintenance costs. If the assets are not breaking down, a greater percentage of maintenance work can be performed in a planned and scheduled manner, which enables the workforce to be twice as efficient. Fewer spare parts will be required. Less overtime will be needed. Contractors will be used less frequently. All of these result in significant reductions in maintenance spending. It is not unusual for organizations to experience as much as a 50% reduction in maintenance cost as a result of moving from a reactive style of management to a proactive approach. Several studies have indicated that asset reliability and employee safety are closely correlated. When the operations are unstable, as in a breakdown environment, employees are often placed in awkward situations. They often take shortcuts in an effort to get the plant back up and running, increasing the likelihood of an injury. A culture that values reliability, however, minimizes these situations. Additionally, the same behaviors that result in improved reliability – the discipline to follow procedures, attention to detail and the perseverance needed to find the root causes of problems – result in improved employee safety. Equipment breakdowns inevitably result in process upsets. It is difficult to have a stable, optimized process when the production equipment is constantly failing. This inevitably results in problems with final product quality. When reliability is improved, process variability is reduced and statistical process capability (CpK) is increased. This results in the capability to have a more stable, predictable manufacturing process. Many organizations spend an excessive amount of capital funds to replace equipment that failed far earlier than it should have. If routine maintenance is continually deferred due to production demands or resource limitations, the organization is in fact mortgaging the future value of the asset – taking the capital value from the future and spending it today. The end result is a wasted asset that must be replaced. The financial result is excessive write-off expenses and a requirement for a constant infusion of new capital. Organizations that place a priority on reliability recognize that newer is not necessarily better, and that a small amount of investment in routine care can pay big dividends in extended equipment life. This frees up capital to be used for more productive purposes, such as expansion or to implement new technology. All organizations require some level of spare parts inventory to ensure the right parts will be available when needed. Reactive organizations typically find themselves carrying a large quantity of inventory because they cannot predict when the parts will be needed. This ties up working capital and results in excessive carrying costs. Organizations that take a proactive approach to reliability place a high value in knowing the condition of their assets. The need for parts is much more predictable. There are fewer surprises; more parts can be purchased on a just-in-time basis. Since the volume of inventory required is based largely on usage, using fewer parts means keeping fewer parts on hand. In most reactive organizations, employees don’t exhibit a sense of pride in the workplace. The high frequency of equipment failures demands that paying more attention to making repairs and managing the consequences of equipment failures than to routine preventive maintenance and housekeeping. Dirt and contamination is widespread; little attention is paid to cleanliness. In proactive organizations, however, basic equipment care is considered one of the most critical elements affecting equipment reliability. Emphasis is placed on routine cleaning, inspection for deteriorating conditions and basic lubrication. In most cases, this is done by the personnel operating the equipment and is a fundamental job expectation. As they take an interest in the condition of equipment, operators tend to develop a sense of ownership – in the appearance of the equipment and its operating performance. Equipment failures in many chemical processes can result in releases of hazardous substances to the environment. Improving equipment reliability reduces the risk of environmental releases. In fact, the OSHA 1901.119 Process Safety statute specifically requires that the mechanical integrity of equipment containing hazardous chemical substances must be maintained. Even if the facility is not required to meet the Process Safety statute, there still may be equipment covered by state and local environmental permits. In all cases, the same systems and procedures that protect the reliability of production equipment will protect permitted equipment as well, greatly reducing the risk of environmental releases. Reactive organizations can never predict when a critical equipment failure will occur. Murphy’s Law typically applies; it will invariably happen at the most inconvenient time and will require craft resources to be called into the facility to correct the problem. To counter this reality, most reactive organizations have a large percentage of the maintenance workforce spread across all operating shifts just in case a failure occurs. In this situation, the equipment, not management, is in control. Large amounts of overtime are necessary. In organizations that focus on reliability, breakdowns are much less common. A larger percentage of craft resources are on day shift where adequate staff support is available to increase their productivity. Fewer resources are waiting for breakdowns to occur because equipment condition is known and early warning signs of distress are heeded. No organization can afford to accept its current level of performance or competitive pressures will eventually drive it out of business. An organization must continue to improve. One key element of Reliability Excellence is an organizational focus on continuous improvement. A great degree of emphasis is placed on systems that provide data on current performance, and the analysis of that data is highly valued. Rx is a business philosophy, driven through cultural change that focuses on equipment reliability and process control as the foundation of modern manufacturing operations. By designing reliability into daily plant operations and creating a culture of prevention and improvement, plants can operate as safer, more productive and more profitable businesses. Production-led reliability - By the very nature of their jobs, equipment operators have a closer connection with the equipment than the maintenance department. Building a partnership between production and maintenance, in which production owns the equipment and maintenance provides reliable capacity, creates the optimal balance between operations, production and reliability. Proactive culture - Time, money and resources are applied to preventive and predictive efforts, not just spent on corrective and repair activities. Problems are researched to find the root cause and solutions focus on correcting the source of the problems vs. treating the symptoms. Metrics-based performance - Establishing meaningful, quantifiable metrics enables a plant to measure performance and document improvements. Continuous improvement - Promoting the philosophy that excellence is a process, not a pre-defined level of performance, leads to implementing processes and tools that support continuous refinement and improvement in both equipment reliability and operating capacity. Implementing Rx is best done in a series of five discrete levels. All levels must be in place for a site to fully achieve Rx. Each one must be implemented and solidified in turn; failure to do so will leave gaps that will make the next level much more difficult and may even jeopardize the success of the entire effort. Each level has specific elements that must be in place for that level to be fully functional. The first level of Rx implementation involves building the foundation for the entire process. This is the most critical area to address. If the foundation is not solid, the Rx initiative will not produce the desired results. Two elements comprise this level – Plant Partnerships and Management Commitment. Change initiatives require three things to be successful: dissatisfaction with the current state, a clear and compelling vision of the future state and a detailed transition plan to get to the future state. Site leadership must provide the first two. For this reason, management commitment is one of two foundational elements of a Rx initiative. There must be valid business reasons for embarking on this journey. It may be site profitability, market forces or simply a corporate directive. In all situations, local management must have a clear idea of the business value to be gained from such an initiative. Otherwise, resistance to change will be high. Implementing Rx is not a short-term endeavor – it typically takes three to five years to implement fully. Because it is difficult to maintain focus on any initiative for this length of time, Rx must have sustained management understanding, commitment, support and involvement. Management must exhibit the correct behaviors that reinforce the transition. Management commitment is needed to ensure that the next foundational element, plant partnerships, is in place. Sites cannot achieve Rx with sole focus on the maintenance function. The maintenance function does not have entire control over all aspects needed to produce reliability – initial equipment design, installation, operating within design limits, access to equipment for PM, etc. A partnership must exist between all departments affecting equipment reliability. Each group should understand the relationship between its systems, procedures and actions and the resulting impact on reliability. Like safety, reliability must be part of everyone’s responsibility and management must drive this. If an adversarial relationship exists between maintenance and operations (or any other function, for that matter), the effort will not be successful. The culture is the set of rules and philosophies that govern day-to-day behavior. Local leadership “owns” the culture and is responsible for changing it. It is unreasonable to expect employees to behave any differently unless management is able to articulate a new philosophy and change their own behaviors to support it. The status assessment paints a clear picture of the current state and provides a starting point for creating a vision for the future. All organizations require a periodic review to identify shortfalls in functional performance and to provide direction for improvement opportunities. This is most effective when done by someone outside the local organization because they are not bound by the paradigms produced by the facility’s culture. The Status Assessment evaluates the existing systems, structure and processes that produce the current results. Only when these are known can a site be prepared to develop a plan to migrate to the future state. In the Rx model, the new philosophy is known as governing principles. These principles represent a set of shared beliefs that all functions in the organization must share to create a culture that values Rx. Site leadership must develop and articulate these beliefs and values, then share them throughout the organization. Essentially, the governing principles become the set of rules and attributes defining the new culture. As stated earlier, one of the things necessary for change is a compelling vision of the future state. This concept is somewhat nebulous to many people, but can be clarified in a set of objectives and goals that define the results that must be achieved. Metrics drive behavior. The correct metrics, used correctly, will drive the correct behavior. Ideally, these objectives, goals and targets are created after a clear statement of the mission (one of the governing principles) has been developed. One of the requirements for change is a detailed transition plan to move the organization from current state to future state. In the Rx model, this is known as the Master Plan. Organizations typically require three to five years to make the transition from a reactive culture to a proactive one that embraces Rx concepts. It is very difficult to sustain any initiative for this length of time, much less one of this complexity. A written project plan that has active leadership support and involvement is essential to help the organization sustain its focus and implement all required activities. The final element in defining the new culture is to create a climate that promotes a concern for quality and precision. Employees must be encouraged to become engaged with their minds as well as their hands. Management must create a working environment that promotes the correct organizational behavior. When the entire workforce is able to achieve a high level of self-satisfaction, everyone in the organization will benefit. This does not mean that everyone should be allowed to make his or her own rules. Proactive organizations are highly disciplined; everyone understands and follows the appropriate policies and procedures. Examples include “No maintenance work is done without a work order,” or “Preventive maintenance activities are considered some of the most important work that we do.” It is within the framework of these procedures that employees are encouraged to excel. Quality is defined as conforming to requirements rather than a degree of “goodness”. Deviation from established standards cannot be accepted. One key differentiator between reactive organizations and proactive organizations is the degree of discipline within the workforce. Employees face choices every day. They can choose to take shortcuts (that invariably lead to substandard performance) or they can choose to do the little things right that lead to superior results. Performance management is the process by which management holds the workforce accountable for doing the little things right, so the big bad things don’t have a chance to happen. Once the appropriate culture is in place, the facility is ready to implement standardized processes for doing daily work. When change is introduced into an organization, work processes are what we change. In the words of Dr. W. Edwards Deming, “Our processes are perfectly designed to give us the results we are getting.” If we desire improved results, we must improve our processes. The first process to be addressed is the work control process. This is the vehicle by which all maintenance work is managed and documented. An effective work control process screens out the unnecessary and unimportant activities, establishes responsibility for planning and execution of work, reduces mistakes, and provides a universal understanding of what is to be done and the priority sequence that is to be followed. Work orders provide a means of charging labor, material and outside services to the asset owners and serve as authorization documents for work execution. As the source documents for maintenance cost and performance control, work orders drive integrated maintenance management. Properly using a work order system establishes accurate work backlogs, facilitates job preparation, enhances control of maintenance work, creates equipment histories and increases effectiveness of maintenance work groups. The next basic process to implement is scheduling. Developing weekly work schedules for the entire crew begins to instill a sense of accountability in the organization. Often, this is the first time each craftsperson and supervisor has had a plan from which to organize their day. They find that much more work gets done when everyone knows at the end of the day what they will be working on the next day and how long it is expected to take. For this reason, scheduling is often the process that yields the fastest return in a Rx implementation. Ideally, weekly schedules are developed jointly by Operations and Maintenance. In successful organizations, the schedule is viewed as a contract between the two groups. Operations commits to have the assets available at the agreed-upon time while Maintenance promises to have the resources – labor, material, contractors, etc. – available to execute the work promptly. Both groups are held accountable for compliance. Proper maintenance to insure reliability on installed manufacturing equipment doesn’t begin with a mechanic or engineer. It begins on the floor where the equipment operates. And who better to take care of that equipment than the individual who lives with it when it operates? The operators have the first and best opportunity to insure the reliability of their equipment. We usually think of operations management as owners of equipment, but they don’t live with it – the operators do. Operator care is all about putting ownership where it belongs. You are the owner/operator of your car and hopefully you wouldn’t wait for a mechanic to tell you that your car needs maintenance. You do maintenance on a time-based schedule or when you first notice something going wrong. That is because you depend on this car (machine). You are the one behind the wheel, use it daily and have the first look. That is where an operator is. And that is where proper maintenance leading to Rx begins. No amount of maintenance effort can put reliability in a marginal design. Studies have shown that 95% of the ultimate life cycle cost of an asset is determined at the design stage. An effective equipment and process design system must be in place that focuses on minimizing the total life cycle cost and maximizing asset reliability. Preventive maintenance is the routine cleaning, lubrication, inspection and adjustment that all machinery requires to maintain good health. It may also include replacing components known to be subject to wear. Its objective is to prevent equipment failure and the corresponding downtime and repair cost. When vigorously pursued, this element is arguably the most critical for creating a proactive environment. Knowledge of equipment condition provides a framework for all planned maintenance activity. An unfortunate aspect of maintenance is that if basic equipment care activities are skipped, the consequences are not immediately obvious. The equipment will operate for some time, perhaps for weeks or even months. However, it is inevitable that it will eventually fail. Proactive organizations understand this and consider preventive maintenance to be some of the most important work that they do. Basic preventive maintenance is time-based; it is done on a set schedule or elapsed hours of operation. 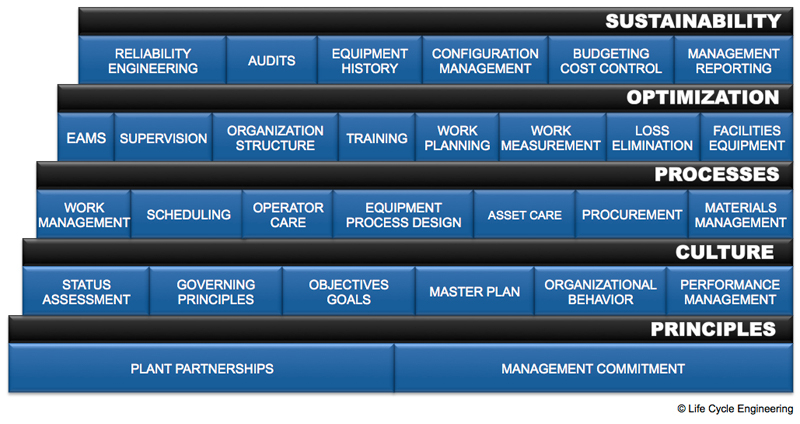 Many organizations assign responsibility for these tasks to operations personnel. This is an excellent method for gaining their involvement in reliability and creating a sense of ownership for the equipment. In these instances, the maintenance function must not abdicate its responsibility to ensure the tasks are done according to the schedule. Predictive maintenance takes a preventive maintenance program to the next level. It includes testing and inspection activities that generally require more sophisticated means to identify deteriorating conditions than the basic visual inspections of preventive maintenance. In most cases, impending problems can be detected much earlier in the degradation process and corrective activities can then be scheduled at a time most convenient to the operation. Additionally, most equipment can be monitored during operation, eliminating downtime required for intrusive visual inspection. An added benefit of a mature predictive maintenance program is the ability to use technology to assist in identifying the causes of equipment problems. Analysis of the operating dynamics of machinery can often identify issues related to design, maintenance or operational procedures that impact equipment reliability. Several studies have shown that maintenance activities performed on the basis of equipment condition are nearly always less expensive and more effective than those conducted on a calendar or usage basis. An effective procurement process must be in place that ensures materials are purchased with an eye toward minimizing the total life cycle cost of the asset. When we consider all of the hidden costs associated with equipment and parts procurement, the procurement function can have a huge impact. If a component substitution is made on the basis of low price, it may result in excessive downtime. When a different vendor is selected from the plant standard, it may result in the need to stock additional spare parts or to incur additional training costs. The next process to put in place is the one that provides the parts and materials required to perform maintenance work. An effective materials management process ensures the right materials are available at the right time in the right place at the right price. To effectively fulfill its mission, the maintenance function depends on reliable and prompt material support (spares, replacement parts, supplies and special tools.) These are either stored on site in the form of inventory or are purchased from outside vendors as the need arises. In either case, the best maintenance program in the world will fail without an effective materials management process. When the basic processes are put into place and are functioning to some degree, it is time to work on the elements required to optimize them. These can be addressed in virtually any order. It bears repeating that implementation of the basic processes must be done before attacking this level of Rx – otherwise, there’s nothing to optimize! The Computerized Maintenance Management System (CMMS) / Enterprise Asset Management (EAM) automates the work order process and enables collection, dissemination and analysis of data. Obviously, the configuration of the CMMS / EAM must be consistent with the design of the work order process. Proactive maintenance organizations run on information. The CMMS / EAM is the primary source of this information. Cultural discipline must be in place for this tool to be used effectively and to provide the maximum return on investment. The computer system is a highly ordered entity. If the work order process is not well defined and universally followed, we are attempting to overlay structure onto an unstructured process. This is always a recipe for failure. Good supervision is the art of getting average people to do superior work. The Maintenance Supervisor is responsible for the effective execution of work. Once the plan is created, his team direction becomes the critical factor. Craft resources need to know job details, how the job is to be performed and what is expected of them. Although the Planner has provided these details in the work package, the supervisor is the backbone of job execution and is solely responsible for conveying these elements to the craftspeople. The supervisor is the direct link between the hourly workforce and management. It is his responsibility to enforce the appropriate organizational behavior. It is also his role to create an environment within his team that facilitates the identification and resolution of reliability problems. This function optimizes the scheduling process by ensuring that craft productivity remains high enough to accomplish scheduled work promptly. An effective organizational structure must be in place that promotes a proactive mindset and clearly defines individual roles and responsibilities. Spans of control must be reasonable to allow individuals to carry out their responsibilities effectively. Often, a site will change its organizational structure in the vain hope that reshuffling the deck will create some miracle of improved performance. It is important to realize that simply changing reporting relationships – lines on a sheet of paper – within an organization will not necessarily drive the correct behavior. It is what people do that delivers results, not who their boss is. For this reason, the organizational structure must be aligned with the work process. In alignment, it will facilitate the correct behavior. If not aligned, it will detract from the effectiveness of the process and may even render it useless. To achieve Rx, the organization must provide for the three functions of maintenance management: supervision of work execution, planned work preparation, and engineering dedicated to eliminating repetitive failure. In addition, the organization’s structure must be designed so that the three types of maintenance work – reliable routine service, prompt emergency response and timely backlog relief – can be performed effectively. Tomorrow’s technology cannot be maintained with yesterday’s skills. Technology is progressing rapidly and the skills of the workforce must advance at the same rate or reliability issues will result. An effective skills training program ensures capabilities keep pace with technology. There is also a growing shortage of skilled craft resources. Industry is finding it difficult to locate replacements for natural attrition and must create their own skilled craft labor. Ideally, training should be targeted at skill deficiencies. This is most effectively done through a well-defined process: identifying the skills needed to do the job, assessing individuals against that skills inventory and customizing a training program to the skills gaps. A good training program and formalized work processes are mutually supportive. Training supports the work processes by ensuring craft resources can perform work at acceptable levels of productivity. It also promotes scheduling and work assignment flexibility when personnel are skilled in more than one craft. However, if formal work management processes are not in place, even the most highly skilled craftsperson will not be productive. Maintenance work is done productively when sufficient preparation – arranging for tools, materials, work instructions, specifications, support crafts, etc. – is done in advance. This formal process, known as work planning, should be performed by professional planners. It takes a unique skill and organized thought process to properly prepare work to be done by others. It is important to realize that whenever maintenance work is done, it is planned. Someone decides what needs to be done and what materials and tools are required. In reactive environments, it’s usually the craftsperson that makes these decisions and it’s normally “under the gun” of a breakdown that has to be repaired quickly. There is little time for forethought. Several trips are required from the work site to the storeroom for parts, tool crib for tools, or maintenance shop for technical information. These all result in wasted time and effort. Studies have shown that a planned job only takes half the time as the same job done without planning. Planning enhances several work processes described earlier. It facilitates the work order process by allowing work to be done in a more orderly fashion. It helps the scheduling process by defining work content, allowing more precise estimates of job duration. It helps optimize the materials management process by enabling materials to be purchased when needed, reducing the need for inventory. Realistic labor estimates are an essential part of a planned maintenance program. There is no effective method of balancing available craft resources with workload without work measurement, and it is difficult to make realistic promises when taking equipment out of service. Estimates are also essential when determining what the correct staffing should be for each labor grade and what level of crew performance is being attained. Work measurement enhances the scheduling process by creating the ability to make accurate time commitments and to ensure al resources are fully loaded with work. The work order process is optimized with the measurement of backlog and labor distribution by work type. The preventive maintenance program benefits by ensuring that the scheduled jobs can be done per the plan. Not “over committing” craft resources reduces superficial inspections. The loss elimination process begins with measuring asset performance. For manufacturing, the tool to use is OEE – Overall Equipment Effectiveness. Essentially, OEE is the product of Time x Speed x Quality efficiencies. Comparing ideal OEE performance to current state performance will identify gaps in the three loss categories. It is equally important to know what a 1% loss in OEE is worth in profit to the organization. The next step is to create a Pareto chart indicating the losses in each category to allow people closest to the specific problem to conduct a RCFA – Root Cause Failure Analysis. Knowing how much the problem costs, and the root cause, enables the organization to develop an economic solution that will either eliminate or at least reduce the chance of reoccurrence. The organization must create an environment where performance is communicated, a culture where people are engaged to relentlessly identify and eliminate defects. A well-developed maintenance organization cannot realize its full potential without adequate, well-situated and well-equipped facilities. This implies not only the physical location and size of maintenance facilities, but also the layout and equipping of shops, offices and storerooms. In addition, special tooling must be available to craft resources as needed to perform assigned work efficiently. There are few things more frustrating to skilled personnel than trying to do a quality job without the proper tools. Adequate facilities and equipment support efficient execution of work by minimizing delays and wasted effort. Clean, well-organized surroundings and proper support equipment promote a concern for quality and precision – both essential to good equipment reliability. The final level implements those elements necessary to sustain Rx and enable continuous performance improvement. There will always be opportunities to improve reliability, and the systems and structure necessary to manage these must be in place and functioning smoothly. The reliability engineering function is responsible for driving out sources of repetitive failure. Its mission is to provide the proactive leadership, direction, single point accountability and technical expertise required to achieve and sustain optimum reliability, maintainability, useful life, and life cycle cost for a facility’s assets. This is accomplished through two major responsibilities: developing and refining the preventive/predictive maintenance program, and developing engineering solutions to chronic reliability problems. Although many of the other elements indirectly affect reliability by creating the infrastructure necessary to manage it, the reliability engineering function has more of a direct effect. For this reason, it can and should be able to justify its existence in financial terms on an annual basis. Each Maintenance Engineer should identify and resolve operational or maintenance problems with an equivalent value of at least twice their annual salary. When new processes (or refinements to existing processes) are put in place, one cannot make the assumption that they will be followed unilaterally. A well-conceived strategy of regular process audits will ensure that individuals are complying with the new design and will offer opportunities to identify areas for further refinement. If the process changes are worth making, they are worth auditing. If management does not follow up, it is a sure bet that people eventually will deem them unimportant and develop shortcuts – to the detriment of results. The use of historical repair and maintenance information is critical to continuous improvement in reliability. Equipment history makes it possible to refine preventive and predictive maintenance programs by targeting maintenance tasks to failure modes actually observed. It also allows the maintenance engineering function to identify chronic reliability problems on the basis of real data instead of gut feel or conjecture. Equipment history is produced by a sound work order process and requires very little extra effort to input information about problems, causes and actions taken. It also helps refine planning and work measurement processes by providing actual information that can be compared to initial estimates. Configuration management is the process that controls changes to infrastructure and assets. It consists of two main elements: actions necessary to optimize the useful life of the facility and management of physical changes to identify and control unintended consequences. It is intended to bring logic and discipline to the process of managing the life cycle costs of facility assets. An effective process will ensure that all decisions that directly or indirectly affect reliability, maintainability, life cycle costs, and financial performance of the facility are made through analysis of factual data and a disciplined decision-making methodology. Configuration management sustains Rx by ensuring that equipment configuration is appropriately controlled and that the equipment maintenance strategy remains valid. It also ensures that necessary information – O&M manuals, Bills of Material, repair procedures, etc. – remain current. The budget for maintenance and reliability often represents the single, largest controllable cost line item in an organization’s budget. It is critical to manage these expenditures carefully, and an effective budgeting and cost control process will accomplish this. A budget is a cost goal. It is not primarily historical and should be considered as a forecast of future expenditures. Budgets will never be meaningful if established as an arbitrary percentage increase (or decrease) over the previous year. An effective budgeting process considers individual equipment maintenance needs, and therefore should be developed from a zero basis by major equipment item. Future reliability improvement projects should be taken into account if cost reductions are anticipated. An effective work order system that distributes all costs to the equipment level is necessary so that the budget can be controlled at the equipment level. Effective cost distribution will indicate if continuous improvement activities were effective. “What gets measured gets improved.” Management reporting is the process whereby management receives feedback on performance of a given process and makes corrections as needed. Management reports are used for two main purposes: to provide factual information on which to base plans, decisions, and actions to monitor and control operations as required, and to enable the manager to evaluate the effectiveness of those decisions. An effective reporting system sustains the Rx initiative by tracking performance against the critical metrics defined as objectives, goals and targets. It also supports continuous improvement by validating that desired changes in organizational or process performance are actually occurring. The five levels of Reliability Excellence must be addressed in turn for a site to fully achieve its potential in reliability, lower costs and increased profitability. Each builds upon the successes of the previous level. If one element in a level is not healthy, it jeopardizes the stability of the levels that follow. Life Cycle Engineering (LCE) has invested more than 30 years in developing processes and methodologies to enable organizations to effectively and efficiently establish world-class reliability and support Continuous Improvement, Six Sigma and Lean Manufacturing. In our experience, the successful implementation of Continuous Improvement, Six Sigma and Lean Manufacturing requires a solid foundation of Rx best practices. Implementing Rx creates the stability required to sustain the benefits from these other initiatives. © 2007 Life Cycle Engineering, Inc.